Before I went, I asked a friend who has attended many what I should wear. Jeans seemed too casual but dressing up seemed dorky. His sage words: “Dress better than most so people will think you’re important.” Done. The event was held in a steamy, industrial-ish downstairs of a co-working space. The frazzled hostess kept things amusing throughout: announcing there was a break between presentations, and then not, and then there is. Asking to borrow someone’s Mac for a PowerPoint, fixing the feedback-ing mic numerous times, interrupting speakers to interject her thoughts. You get the idea. Somehow these incidents made the event seem more startup-y and authentic, though it was closer to a crash-and-burn for a corporate event-planning pro like myself. It was unfortunate timing for a Hong Kong incubator presenting a detailed, lavish pitch on the benefits of setting up shop and making your first million there. Problem was, it was the same day the political chaos in Hong Kong was topping headlines. I waited for the presenter to reference it, but the elephant in the room stayed quiet, or in this case, the police, protesters and tear gas. It would have been appropriate to say something vague and innocuous like: “We are thinking about everyone in our country during this difficult time.” It shows an awareness and sensitivity to issues other than the almighty dollar bill. One of the investor companies from England played an upbeat, chock full o’Brit perky video promoting the milieu of ways that startups should work with their firm. It was smooth sailing until the horribly matched words like “glocal” and “talentricity” reared their oversized font heads onto the screen. It reminded me of a scene from a “Silicon Valley” script, except that it was real life. Either way, this gibberish needs to fade to black. Forever. 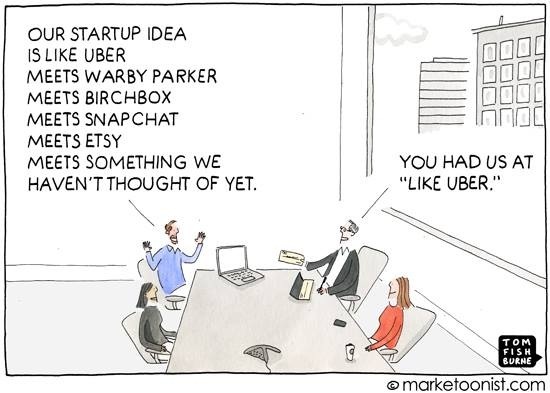 They are counter-culture to everything that is startup. The variety of pitches was astounding: an online organic produce delivery service to an “omni-channel retail kiosk” (which no one understood), to a movie service catering to Southeast Asians. The content and presentations were of varying talent, but the majority were poorly constructed. This is no surprise since entrepreneurs tend to be heads-down creating products, not working on their communication skills (though that excuse can’t be used for companies with VC Big Shots on their advisory boards). The importance of a good pitch cannot be understated—it is the holy grail to getting funded. My take is that a pitch should possess three “C” qualities: be clear, concise, and compelling (in a three-minute package). Weaving a great and logically flowing story into your presentation is absolutely critical. Feedback from the investors was clearly valuable to the entrepreneurs and I got some good advice too: 1) The best way to get to the core greatness and uniqueness of your product or service is to ask your customers—they will give you the read-back of your true value; 2) Leverage the social capital that you have, aka tech influencers, who are usually happy to help, but ask directly for what you want and make it something interesting and easy to do; 3) Know what success means upfront in your business, and if you “pivot,” do so before you are on the spiral to going down in flames; 4) The story of why you started your company is the core of your greatness and at the root of the problems you solve. It’s what drives and motivates you, and what makes you unique. It’s the DNA of your future success. Will I go to another pitchfest? Maybe, maybe not. But it will be awfully cool if one of those companies I saw is the Next Big Thing. some great insights per usual and enjoy your writing style. I passed along to colleagues here at work.